I hit a new body of water today. Not knowing what to expect, I started off using a pattern that worked well for us in this region last year. Basically, I would replicate fishing for smallmouth but with smaller plastics. After launching the boat, the water temperatures looked a tad cold at only 55.5 but I would try none the less. 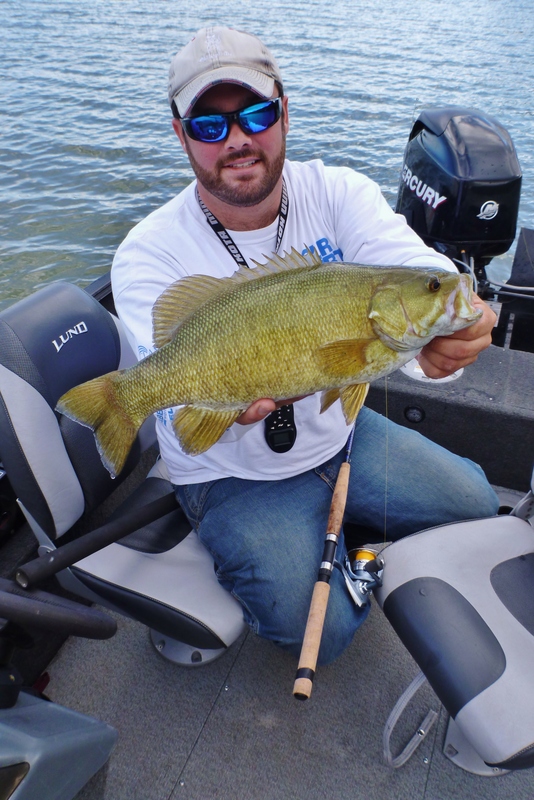 For quite a while, my smallmouth pattern of fishing humps and large boulder produced nothing but smallmouth. After about two hours of pitiful fishing, I hit a fork in the road. From where my boat sat, it looked like I could stay shallow and keep searching basically what I had been or I could work a quickly dropping shoreline. 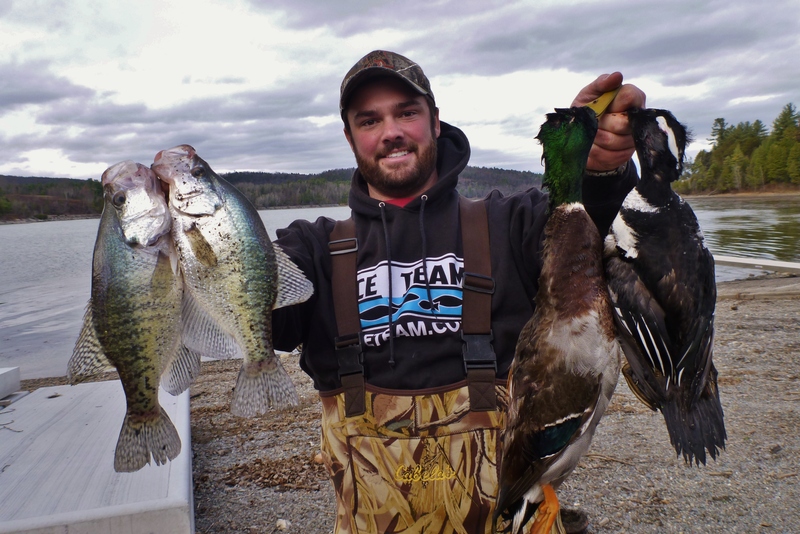 While I thought the shallow water would be their destination for the day, the deeper water might have more to offer at this point. As I started drifting the deeper shoreline, I began to see dark silhouettes of fish suspending over 12′ of water. Below them there was a pine tree with a needles still attached. 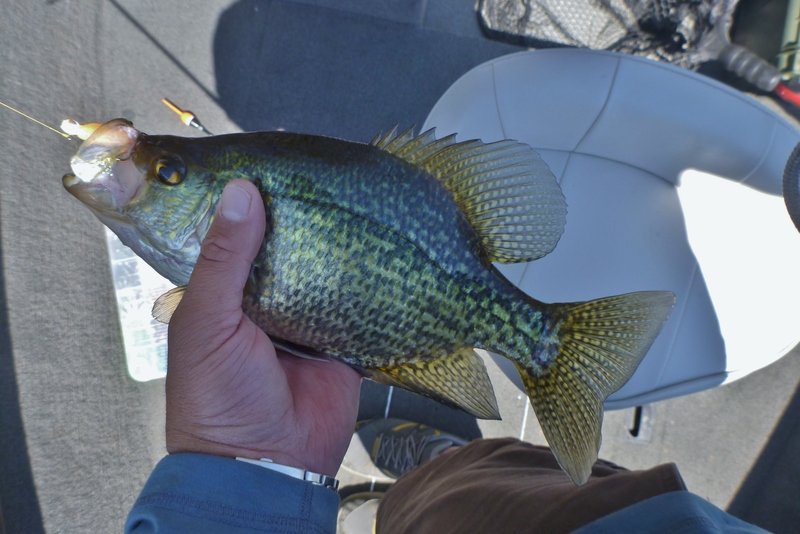 towards the shallower end, hundreds of crappies sat still in every nook and cranny imaginable. I quickly backed the boat out and got to catching. 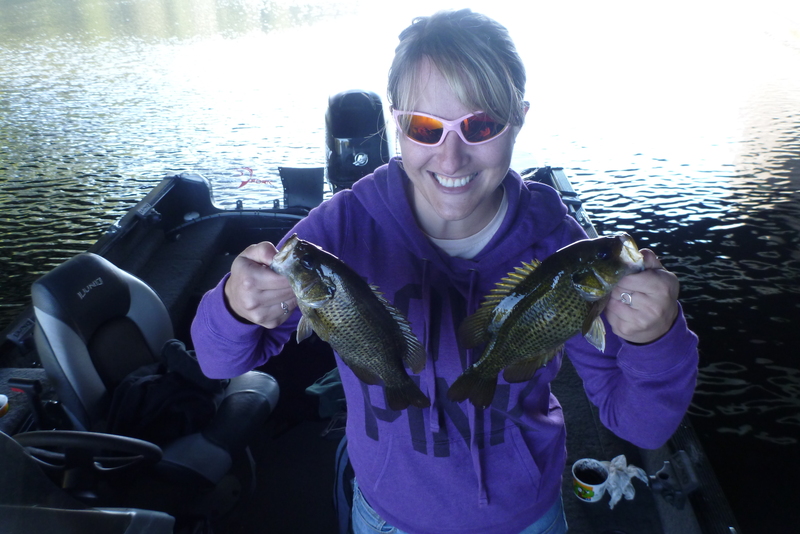 I found that most of the fish I caught were males but as I started to work deeper the females started to show up. Little by little I pieced together a puzzle that worked well for the next few hours. I had a few spots that were all similar and I could catch them non stop as long as I kept switching colors so they didn’t get too weary. Also the brighter the better. Mostly I used the fireperch color of the “Live” Baby Shad by Lake Fork Trophy Lures. 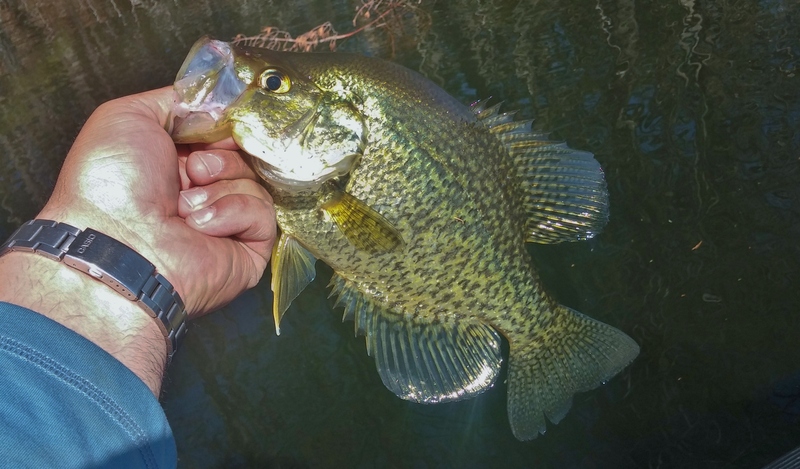 While the crappie bite was great, I wanted to explore another new body of water so I packed it up and headed out. Hoping to have similar success, I had scouted aerial photos the night before trying to locate some points of interest. As I made my way to my first way point, the anticipation built. Things didn’t look good when I arrived as the weeds had not yet shown up and the water was already 66.8. 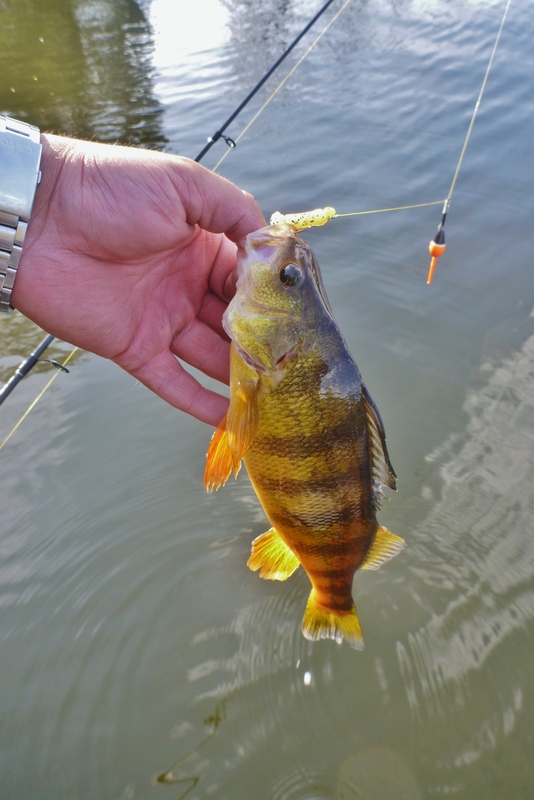 Regardless, I putted around catching good numbers of perch and bass of both large and small variates. Things stayed the same for this and just about every other section of water that I searched. While I can’t complain about numbers and size, the species were not what I desired. In time, I will find them in these locations because I know that they are there but until then, catching perch and bass will have to do! The plan for the day was focused around getting a scouting report for some waterfowl hunting we intended to do the following morning. Rather than go with just one thing on our minds, my two buddies and I brought along some fishing gear as well. While the ducks and geese weren’t flying with great numbers, one of my buddies wanted to set up and try out his luck with decoys and calls anyway. 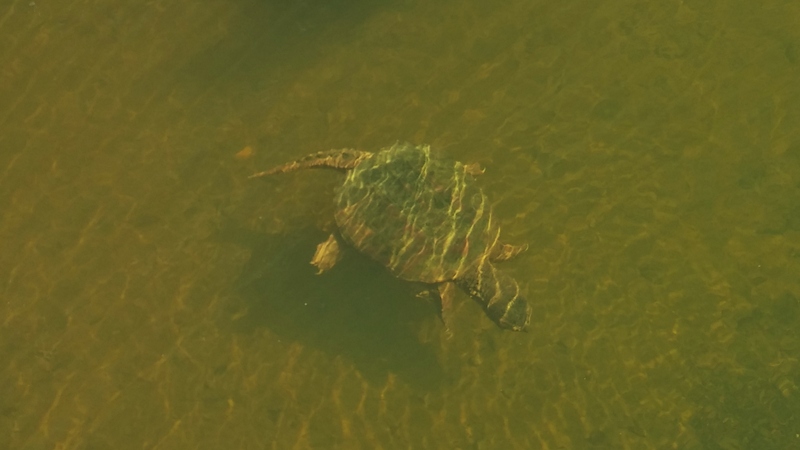 After leaving him off in a small cut, we putted out to where we could potentially catch some fish. 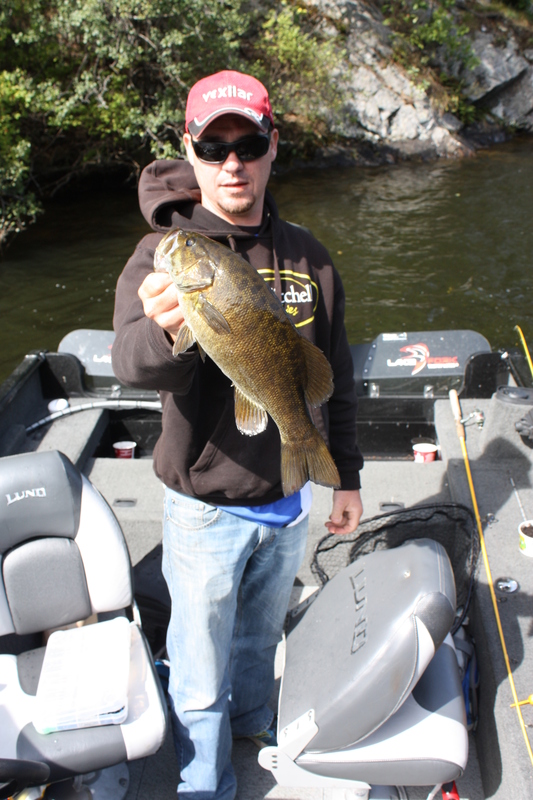 The first spot we stopped at yielded a few walleye, smallmouth bass, and rockbass. 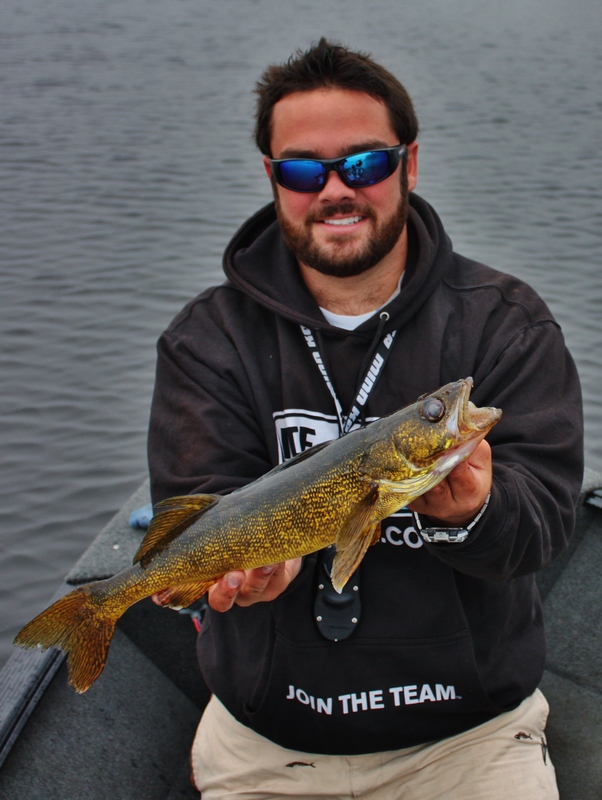 We were sticking to the vertical jigging in wood pattern that has proved successful all summer. One alteration to our approach recently has been to use a whole crawler, rather than half, but hook it in the middle and then hook each end one more time so that there is a little more meat on the hook. We fished a few more spots before trying to locate fish in deeper holes. While scanning around we located a pod of fish in 35 feet of water suspending off a sharp break. We made a quick mark and back tracked with the trolling motor. After a few drops we both hooked up. Bullhead! Big ones at that! We caught a few more before deciding that we didn’t need any more. With the boat suspended over 35 feet of water we started casting to shore. The first few casts produced fish. 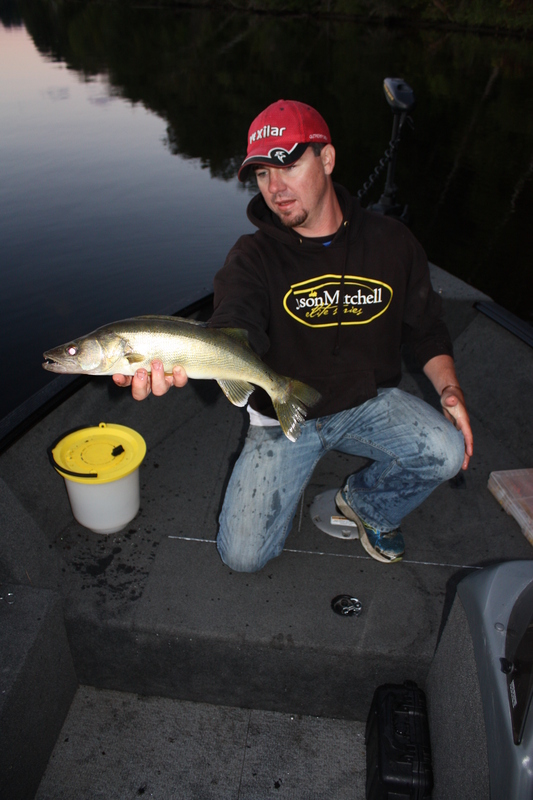 Walleye too! We were dragging bottom and the fish were smacking them! They were charging so hard that it felt like the jig had gone over a ledge and was free falling. Trying to get the slack up before the fish stole the crawler was a challenge! 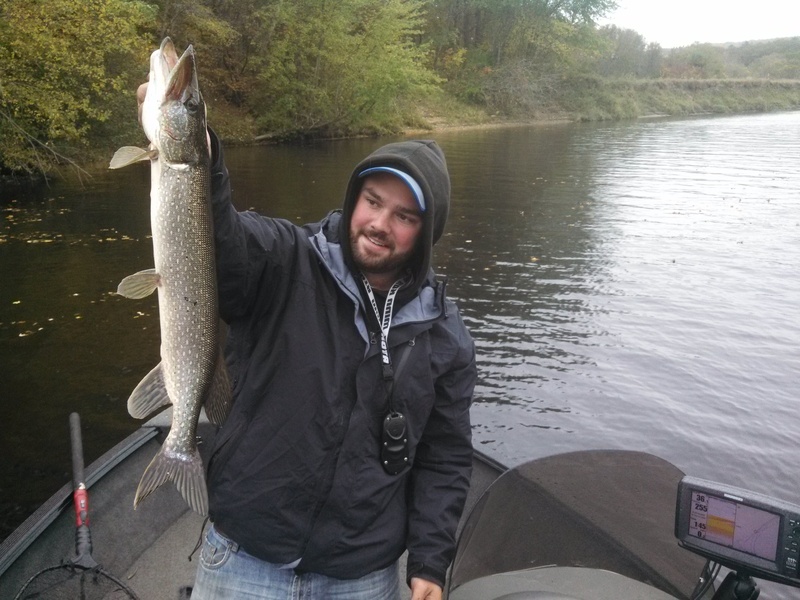 We tried to continue this pattern throughout the entire deep hole but once we left the muddy bottom and hit rocks, the species changed and only perch, smallmouth, and pike were around. My girlfriend and I spent the day on the water trying to get her to boat her first walleye. Even though it isn’t a tough technique, vertical jigging in timber can be overwhelming with the numbers of times you have to retie. Although she isn’t new to fishing, I don’t want frustrate her to a point where she won’t enjoy going with me. For that reason, she is allowed to nap in the boat! I figure more fish for me! We were on the water for sunrise and catching fish wasn’t a problem. 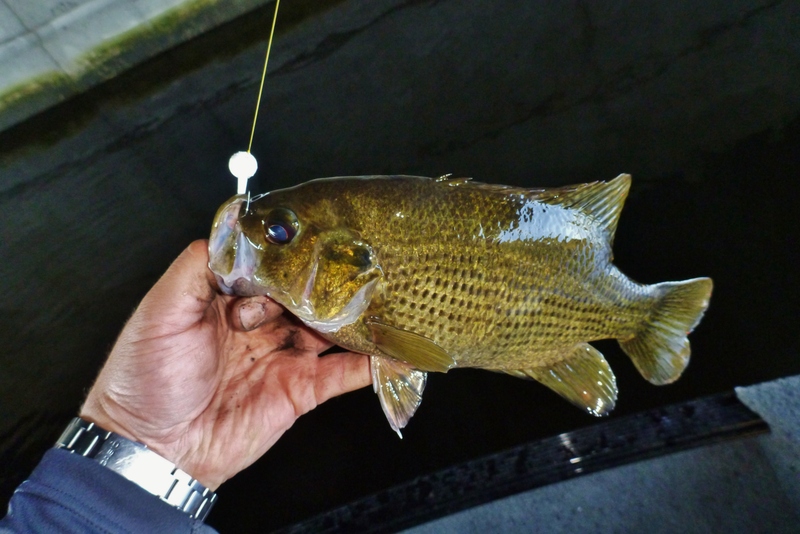 The rockbass, perch, and smallmouth bass were aggressive. 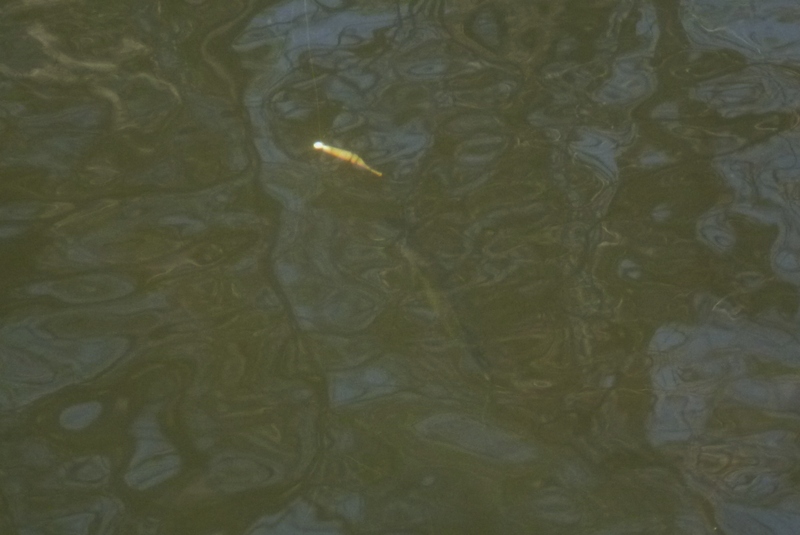 Walleye on the other hand were very elusive. After working with her on techniques to detect bites vs snags and ways to potentially free the jig without snapping off, we were on steady fish. We fished hard until 3:30 and only one walleye was brought in the boat. I wish I could report that it was her who caught it but it wasn’t. 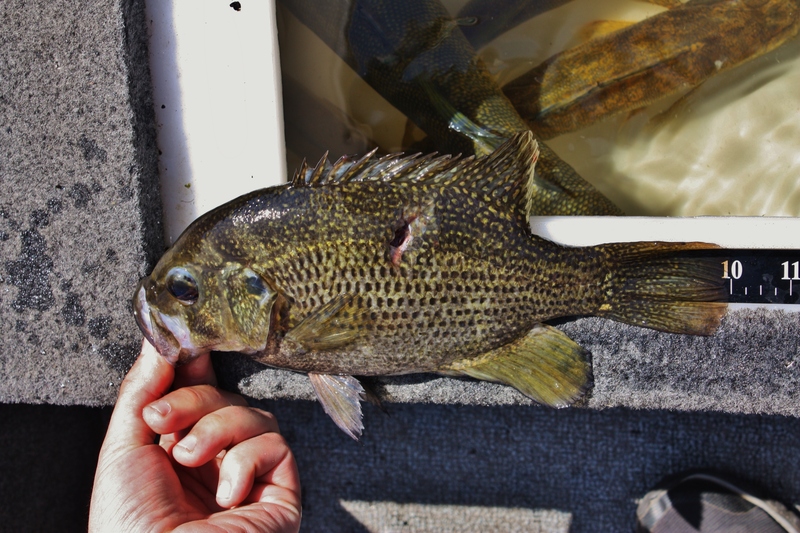 Probably the highlight of the day was one rockbass bite we were on in 30+ feet of water. 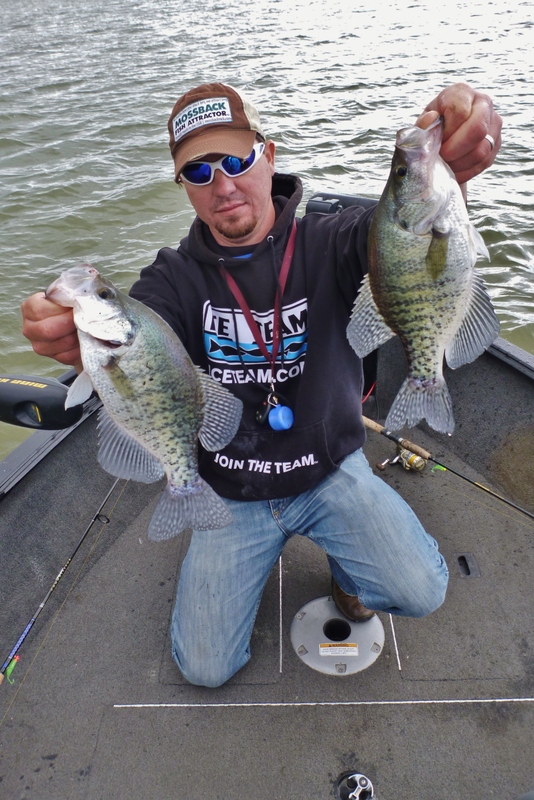 The fish were on before we could reel up slack after closing the bail and they were slabs! Most of them were 11-11.5″! Check out Quick Bite on our YouTube page for more action! We had a full day on the water planned but with wind advisories and rain statewide, deciding where to go seemed like a daunting task. We waited until late last night to make a decision that Lake Champlain offered us the largest variety of available species and techniques necessary to take advantage of anything that would bite. We were on the water shortly after 5 am but not much happened until close to 7. Searching weeds, wood, and rocks, we picked at mostly small crappie until Dylan caught his first catfish. 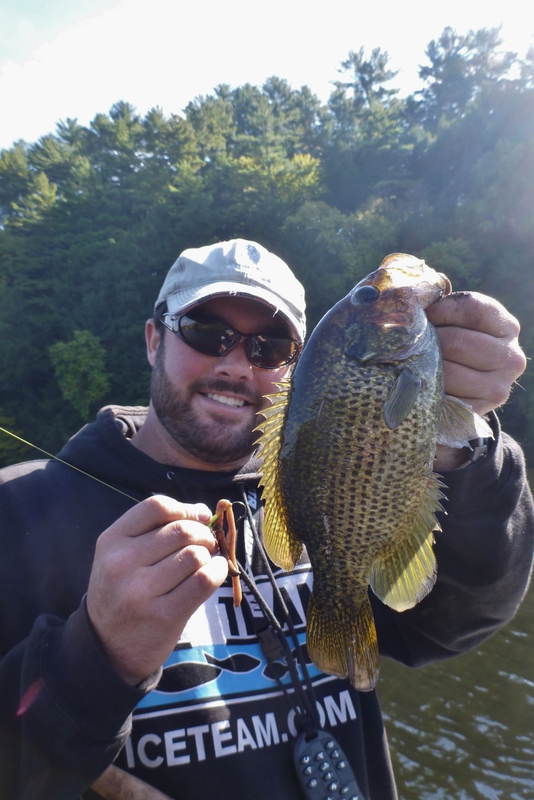 What a fight it was on light weight panfish gear! After the release, we loaded up the boat due to weather report of a nasty storm rolling in on us as well as an increase in wave activity. Chasing blue skies north, we were on the water again with hopes of a better bite in slightly calmer water and no rain. We located fish that were super finicky but over the course of an hour, identified a few sweet spots. 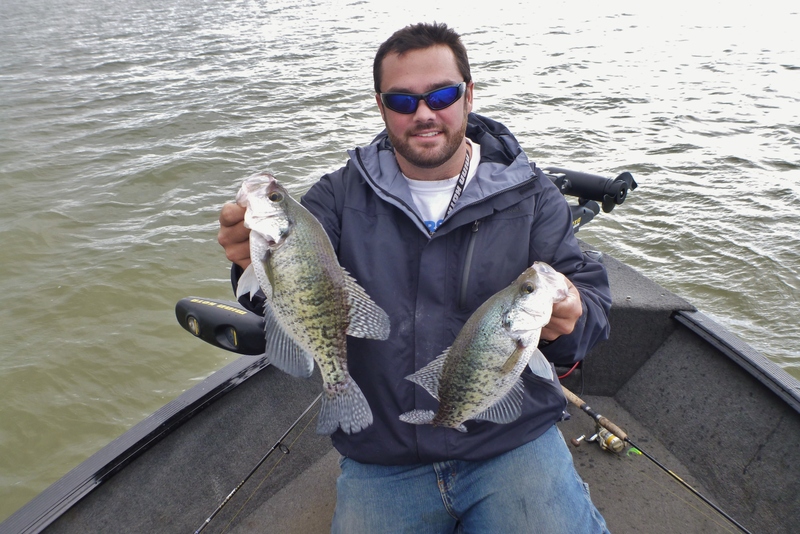 While a handful of crappie were taken home, the majority were released for the winter months to come! 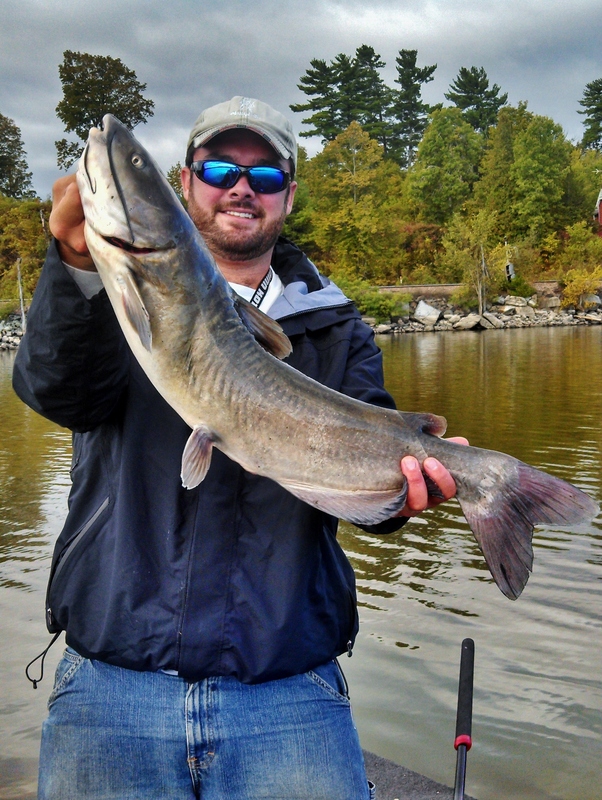 Check out My First Catfish on our YouTube channel for more action! The next spot we hit turned out to be one of the top spots for the day. We located a small, subtle rise in 30 feet of water with lots of bedrock on the downstream side and steep breaks on the inside and outside. 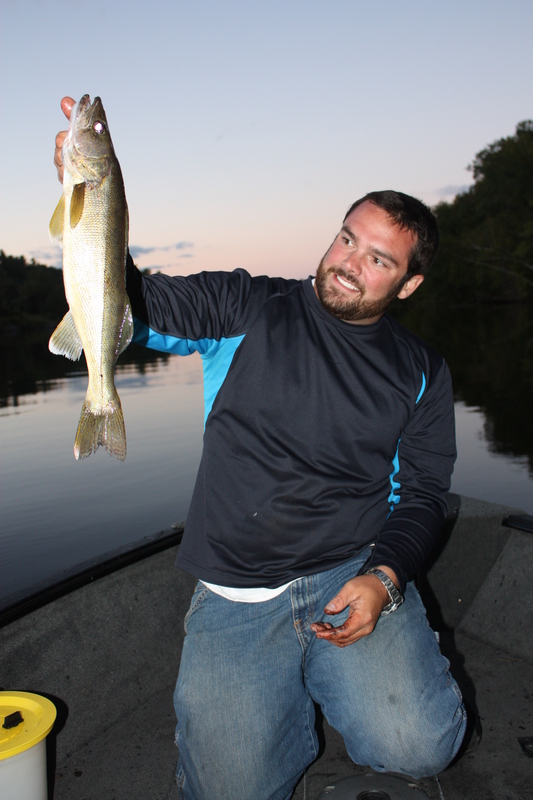 The fish were piled up on top and the first few drops resulted in walleye. 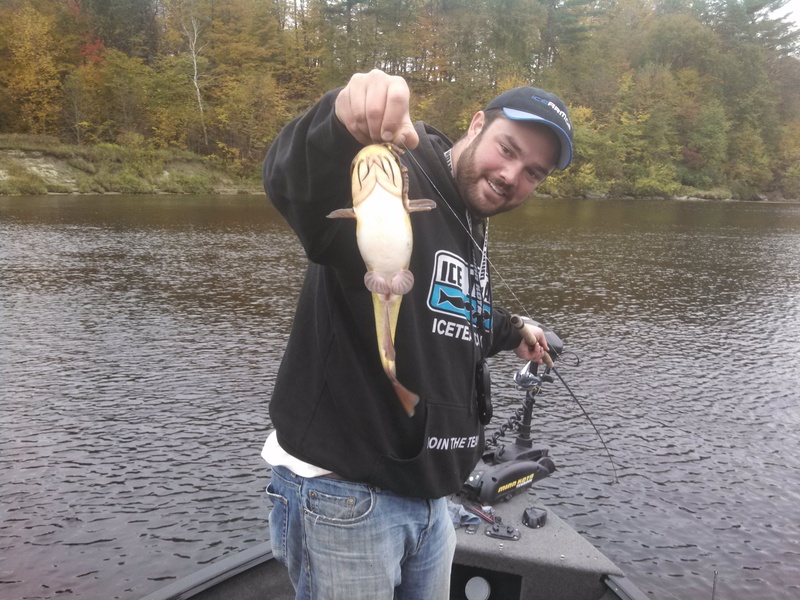 After several walleye under the slot, the bite switched over to rockbass, perch, and smallmouth. We worked the area through and gave it a break to recharge. 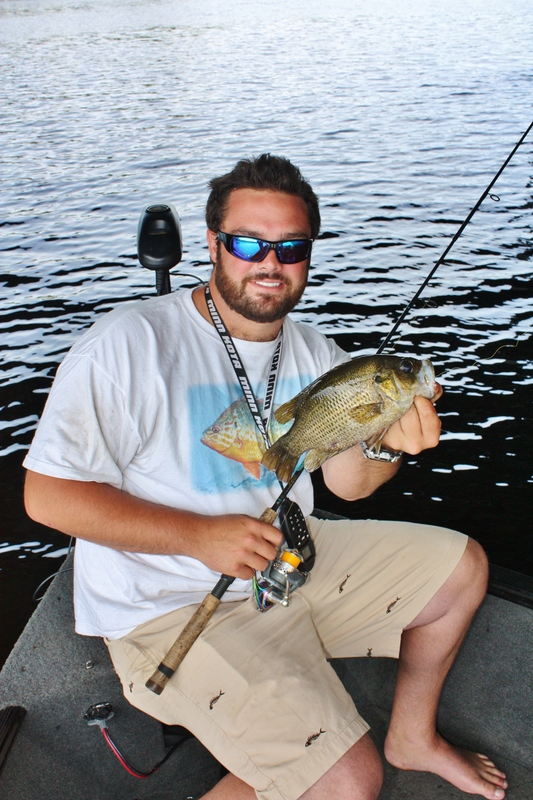 From the next few hours we spent time searching for new locations and checking weed edges for panfish. 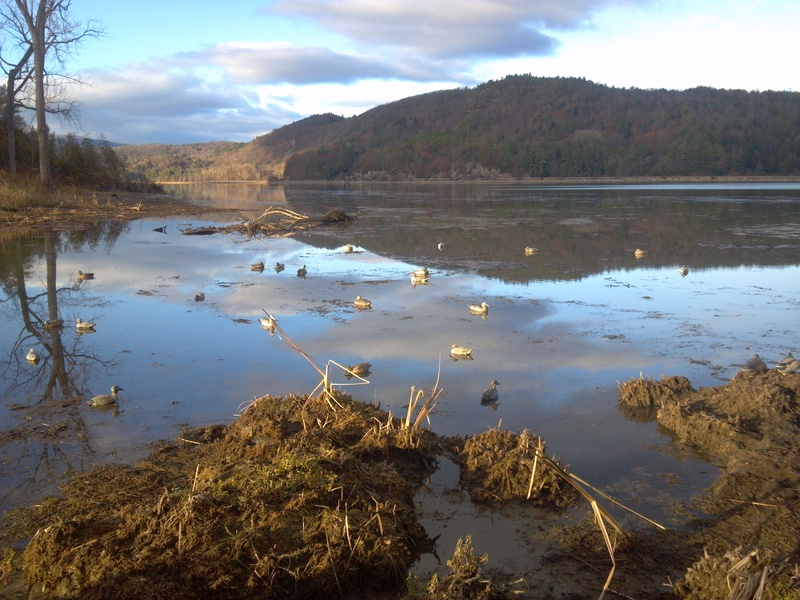 Although nothing was overly productive, we located some great seasonal locations! On the way back to the launch we checked the small rise we found earlier and found the same results. walleye bit first then switched to other species. While trying to locate where the walleye went on the second pass, we located a submerged tree adjacent to a deep water weed edge. We got bit our first few drops and when we got hooked up we each put our fish over the slot in the boat. With our limits complete we went back searching. Before leaving we located a cluster of what we believed to be tires and other debris in deep water. 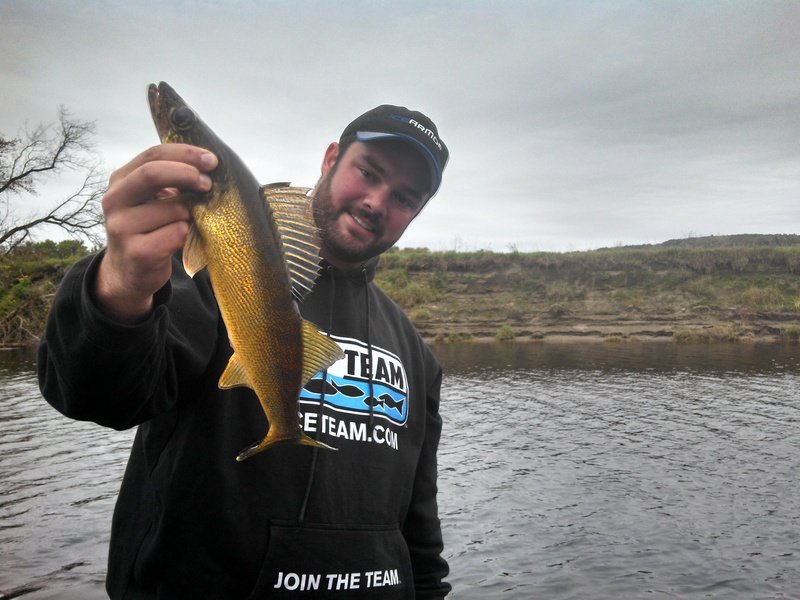 We worked through the area picking up a bunch of walleye and rockbass. To our surprise, tires don’t snag as easily as one would think. Ending the day on a high note sounded like a good idea, plus it was just before dark. We loaded up the boat after a successful day and talked about how we could make the next trip better! Another day of trying something new turned out successful. I hit the water with two buddies early this morning hoping to find walleye on a completely new section of river. Replicating the vertical jigging technique that has proven successful elsewhere, we were in search of mostly wood but in reality any irregularity that might hold fish. 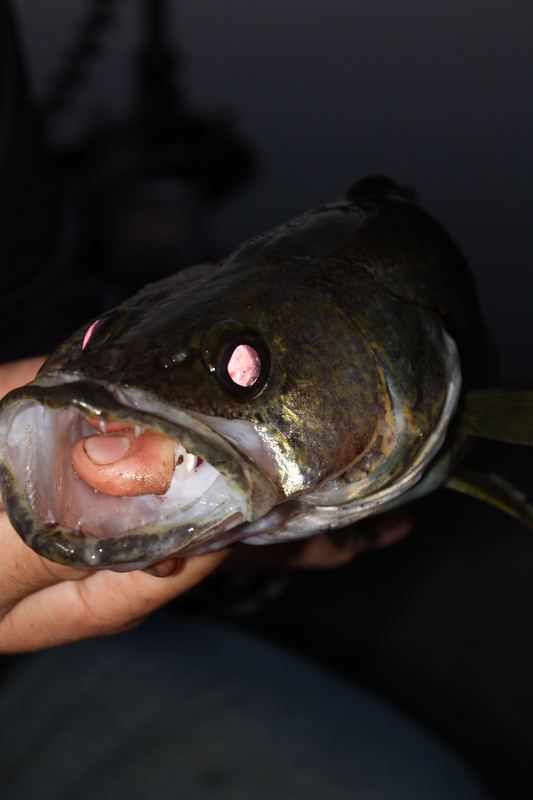 Throughout the course of the day we picked up 25 walleye, a dozen smallmouth bass, some perch, and loads of rockbass. We found that white was the hot color for pretty much the entire day and a steady hand caught more fish a jigging one. Over the course of about 7 miles, we fished a few dozen spots. Of all the spots, probably 75% of them held walleye. While that sounds like a lot of places to catch fish, we passed over so many that looked decent but had to keep chugging. The mission of the day was to explore and that’s what we did. While we didn’t fish every spot possible, we fished the obvious and ideal looking ones and just marked the others with way points. 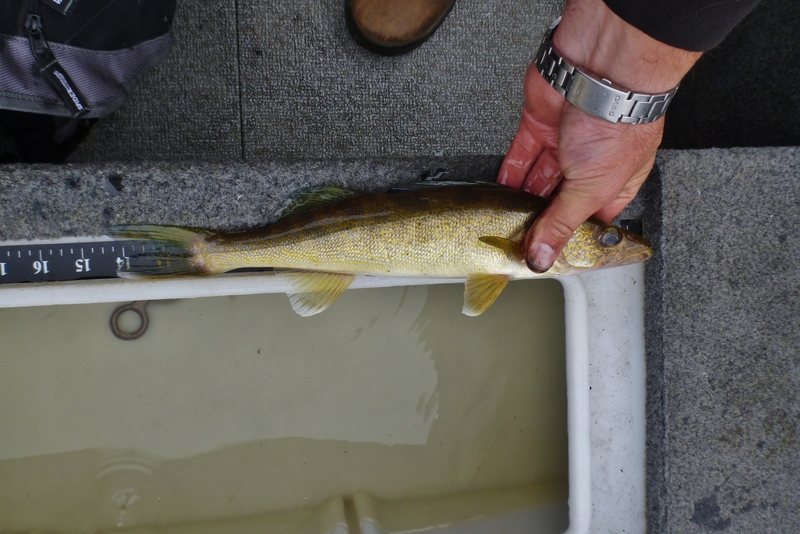 We found that the smallest walleye were holding in deep water (30’+) while the larger fish were in between 12-20′. 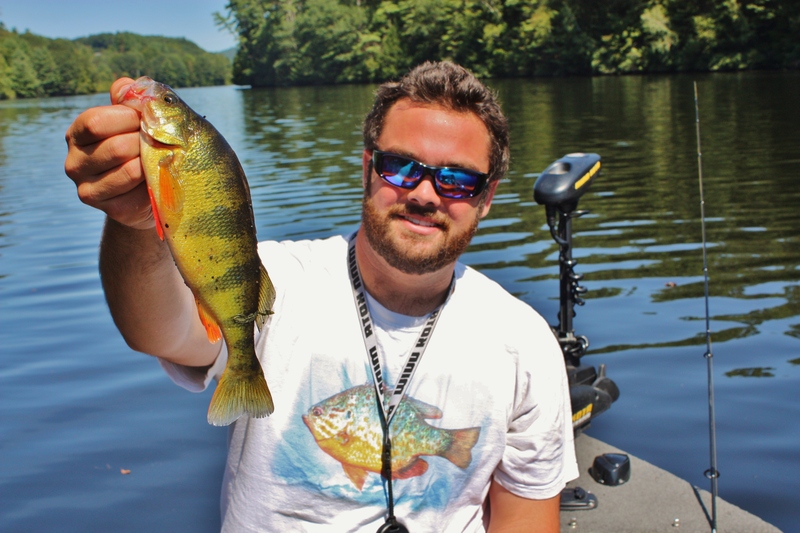 From 20-30′ was mostly a dead zone other than the large and aggressive pods of rockbass.